The Deliveroo team has been getting into the Glastonbury spirit lately, offering everyone a sneak peak at the backstage riders requested by this year’s performers. We’ve packaged rock stars’ backstage requests into “Rockstar Riders” and have made them available to order through the Deliveroo app during Glastonbury for those left watching from home. Naturally, we hit the media hard to tell everyone all about it. The demands turned out to be surprisingly normal, with Ed Sheeran requesting orange squash, cans of fizzy drink and some Manuka honey to help his throat. Katy Perry was a little more specific, with freeze dried strawberries, dried pears and Pinot Grigio on her list of must-haves. 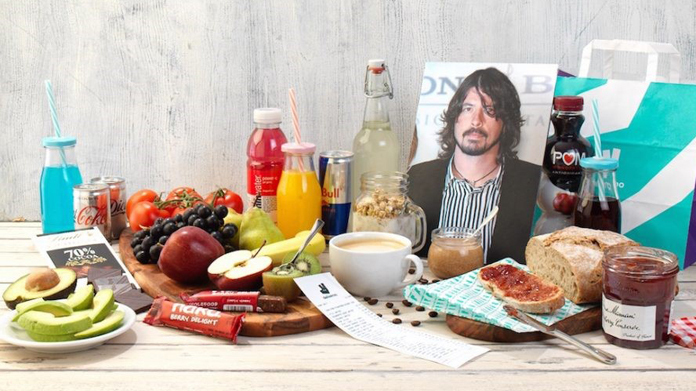 Taking the prize for strangest rider though, has to be the Foo Fighters, who had a massive 92 items requested, with Gatorade, energy bars, Pom Juice and Starbucks coffee beans amongst the items on their extensive list. Coverage has been a hit, with journalists lapping up the perfectly timed story. Landing in The Daily Star print and online (twice), The Sun, Daily Mail and Marie Claire, alongside Sky News, Refinery29, OK! and Metro too. A rock n roll reception we felt!